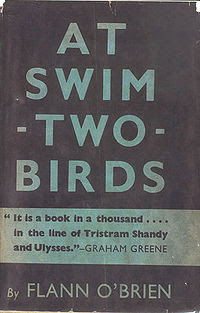 Over at arts blog Big Other, they’re gathering together a reading group for Flann O’Brien’s great comic masterpiece At Swim-Two-Birds, to be consumed at an approachable-yet-respectable clip of 100 pages/week. See AD Jameson’s post about reading guides for the complex-ish modernist book. But don’t be scared! To fully enjoy O’Brien, you really needn’t be equipped with anything more than a good sense of humor and a love for language. I highly encourage people to read along, or at least check in from time to time to listen in during the ensuing book banter.